Supporting Wales, but I think NZ will win the cup. I will be springing with the boks! No disrespect to Pool B teams, but I think England have got the easiest route to the next round out of all the Northern Hemisphere sides. I can't see anybody bothering them too much - maybe Scotland will give them a good game - I hope so. NZ win. Who cares about 3rd/4th. Game results according to expectation so far, although a few scares for England and SA. 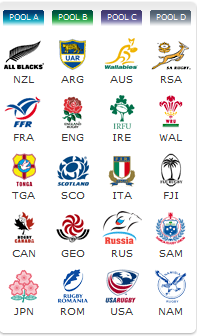 Canada also did well against Tonga, Russia gave USA a scare and Scotland must have died of embarrassment against Georgia. So why the hell did you post in this thread? Pointless wasn't it? If you think it's rubbish, say so and state a reason, although that would be off-topic too. I predicted 'at least 46-3' for the England/Romania game so was happy to see the 67-3 result. Mind you, against that team, anything much less would have been a disaster. > anything much less would have been a disaster. Now that's interesting. If Scotland beat England, it may come down to bonus points. If Scotland score 4 tries against England and England fail to come within 7 points, England go home. However, judging by Scotland's performance thus far, I can't see it happening. In Spain they say: "boys play soccer, girls play volleyball, and men play rugby". Can we accept this phrase? Yep, sounds about right to me. And remember, this comes from a nation of soccer players. They didn't make the Rugby World Cup. Shame. Can I just say, GO WALES!!!!!! What a cracking game of rugby, best of RWC 2011 so far. Oh boy, now *that* was a game of rugby and then some. Wales for RWC2011 anyone? Nice one HG! My heart's still going at 200+. That's the best defence I've ever seen from Wales - they've always been good, but the tackle count would have crippled teams of old. Did you see Adam Jones tuck up Cian Healy? Almost bent him in half in THAT scrum. Cian must have wished that he'd been ploughed a few feet under so that he wouldn't have to show his face. Anyway RWC2011? I think it would be a good bet to make the final, then NZ on the day. Very possible. England v Wales would be a semi-final and a half though, wouldn't it? Scrap that. England are playing like, erm, England. Do NOT deserve to get through on this form, absolute disgrace. 16 - 0 at half time and, to be honest, it could easily have been much worse for England. And what was Ashton thinking, dropped two chances in the last couple of minutes and cost us some hope going into the second half. Not impressed at all. Johnson needs to kick some arse in the changing room, and then some. Anyway, Phil Vickery's commentary must have put the players off. Was he doing a Brian Blessed? Top Man HG :) I'm really looking forward to next week's game. The French will give us a hell of a game, the result of which is difficult to gauge, but the sheer quiet confidence of the Welsh youngsters (Halfpenny, Warburton, Lydiate, Faletau, Priestland, Jon Davies, North, Roberts - all <=24)gives me a lot of hope. Warburton, although just turned 23, is already set to be a great captain. I reckon NZ to win comfortably against Argentina tomorrow (20-30 points). I expect South Africa to squeeze Australia up front and starve them of the ball. However, Australia will be embarrassed about the loss against Ireland and will come out like rabid dingoes. Still think a close win for SA. I'm rooting for Wales through to the final and then fingers crossed that NZ are as weak as they were against the Argies. Can't honestly see AUS upsetting NZ at home, especially after the pretty lacklustre performance against SA. I'm a bit ambivalent wrt Aus vs NZ, however, IF Wales win against France, I'd rather play Australia as I think we've got a better chance of winning, but on the other hand, I'd love to see us play NZ, as I think they are the best at the moment, although nowhere near THEIR best. No offence to the Aussies by this though. The French played well against England but were far from their best I thought, meanwhile Wales played better than I can can recall seeing them do so for many, many years (I'm thinking back to the days of JPR Williams if I'm being honest - seriously, that's the impression it left on me) so if they can keep that momentum going, who knows? Momentum is the key word. Both sides know how to hit the self-destruct button unfortunately. France are well known for being temperamental and inconsistent. From what I've heard Lievremont has been pretty much ditched by the players as they've decided to do their own thing. THey may be able to do that as a one-off, but I wonder how they will react to a side that can change their game plan. Unfortunately, England were bereft of ideas, seemingly unable to change tactics. Using those big backs as bludgeons simply played into the French hands. Mixing up the play with high kicks, back row moves, crash ball centre play, expansive 3/4 play - not to mention disruptive tactics of the blitz defence and set piece front row demolition - should pay dividends.